With the warmer weather, plenty of sunshine, and spring rains, it’s time to get your hedges, shrubs, bushes, and brambles back into shape after winter. To give your landscaping a haircut, you’ll need one of the gardener’s most useful tools: a hedge trimmer. These handy cutters shear leaves and slice branches, making your hedges into prettier shapes. But, there are a lot of hedge trimmers on the market. Which ones are the best for 2018? We’ve done a full comparison for you, so read on to see which one trims the trees for the most bang for your buck. Fast, light, and easy to use, this Greenworks corded hedge trimmer will trim up your hedges, shrubs, and other plant materials in no time. It’s reasonably inexpensive but offers a larger motor than others of its price range. You get a nice long blade, too, as well as a great warranty. The body of this Greenworks 22 inch Corded Hedge Trimmer (Amazon link) is painted an attractive green with a large black curved handle for stability. The body design also includes a hooking cord lock to keep your extension cord from accidentally unplugging. In front of the body is a tall thick plastic hand guard. The long 22” blade is dual action and dual edged to trim either in a downward or upward motion. It has a red stripe down the middle to see it better. The blades are made of steel and can cut material up to 5/8” thick. It’s powered by an impressive 4 amp motor, which not only means more power, but it helps reduce vibration. It’ll cut through hedges, shrubs, brambles, and thorny plants like roses. Despite the big motor, this hedge trimmer is not as noisy as other models. It’s light in weight, weighing only 5.72 lbs. There’s a button tilt to change the angle. The warranty is for four years, better than the industry standard. While this is one of the best hedge trimmers, it has drawbacks. It’s corded, so you will need to purchase the round female outlet extension cord(s) you need. It will cut a cord easily, so you need to watch out for that. It’s also too heavy to use one-handed, so you have to use two hands at all time. There is no lock for the trigger to stay in the “on” position and needs to be pressed at all times. The motor size makes it heavier than a 3.5 amp motor hedge trimmer would be. But if you don’t mind an extra half a pound, you can trim larger material. This fun little orange hedge trimmer is the least expensive of the five listed here, so it’s perfect for gardeners and landscapers on a budget. Black+Decker is one of the most well-known brands for household tools, so despite the low price, this Black and Decker BEHT100 Hedge Trimmer (Amazon link) has quite a few features you’ll enjoy. If you’ve been struggling with heavier trimmers and have a lot of plant growth to get through, then this Black+Decker BEHT100 Hedge Trimmer is ideal. It’s the lightest of these hedge trimmers, weighing only 4.63 lbs. You’ll appreciate this for longer jobs that take more than a few hours. This is a corded trimmer, so you’ll need to purchase separate extension cords and configure your electrical set up. It does have a cord retention feature that keeps the extension cord in place to prevent accidental unplugging. The 3 amp motor is surprisingly powerful and can cut brush and branches up to 5/8” in diameter. You’ll use two hands to operate this hedge trimmer, with one hand on the handle in the back and the other on the T-handle up front. This is also safe enough to use one-handed, unlike some other trimmers. There’s a guard in front to protect your hands. It does have a couple of negatives. One is that the blade is the shortest of all the hedge trimmers, at only 16” long. It’s not best for jobs that need a long reach. For the price and the weight, the motor is a good size but could be more powerful, too. The more amps in the motor, the thicker plant material you can cut. Some users have commented this doesn’t seem to be as durable as Black+Decker products from the past. This is best for smaller jobs like thick ornamental grasses and for those concerned with a heavy weight. Accomplish your gardening chores easier by choosing this Sun Joe 22 inch Electric Hedge Trimmer (Amazon link). It’s an inexpensive, but essential tool for quickly trimming plant material like hedges, shrubs, flowering plants, ornamental grasses, and brambles. At only 5 lbs., it’s also ideal for those who need a lightweight machine. The Sun Joe 22″ Electric Hedge Trimmer is so easy to operate, you’ll have it plugged in within minutes of receiving it and be able to start trimming. This brand is known for its models that are well designed and fun to use. The blade is 22″ long and made from pre-hardened, rust-resistant stainless steel. The body of the machine is lime green, and the blade is bright yellow for visibility amongst green plants. There’s a large rear handle for one hand, and a thick wrap-around curved handle for your second hand. It makes the hedge trimmer more stable. A tall black hand guard protects your hands from plant material flying back at you. For its small size and light 5 lbs. weight, you get a decent sized 3.5 amp motor. It’s powerful enough for handling hedges up to ¼” thick. It comes with a short cord, which is permanently attached. This trimmer is light enough to occasionally use with one hand if you need to move branches aside. This trimmer is great, but we did take issues with some of its features. It is a corded trimmer, so you need to purchase extension cord(s) separately. It’s not very heavy duty or powerful and doesn’t cut thicker material. Although it doesn’t weigh much, it sacrifices power and durability. This is best for lighter gardening work or personal landscaping, and nothing heavier duty. With its 24″ laser cut blade, the GARCARE Corded Hedge Trimmer (Amazon link) is the most luxurious and expensive hedge trimmer you can get, which makes it one of the best. It’s built for more powerful jobs than other hedge trimmers, thanks to the larger motor. If maximum power is what you need, choose this one. If you’re looking for the longest blade length for your buck, then this GARCARE brand hedge trimmer has you covered. Others only have a 20” or 22” blade, while this one is 24” long. When powered by the 4.8 amp motor, you can cut brush and branches up to ¾” thick. The rust-resistant hardened steel blade is dual action and dual edge as well. The blades are shaped with diamond grinders and cut by lasers for accuracy and durability. Having such a big motor also reduces the amount of vibration when using this hedge trimmer. It’s nice to get through an entire hedge job without needing to change blades to handle thicker brush. This is a corded hedge trimmer, so you will need the appropriate extension cord(s). It’s also the heaviest hedge trimmer, thanks to the longest blade and largest motor out of all these models. It weighs 8.6 pounds, so is not suitable for gardeners or homeowners who are seeking lighter weight trimmers. You’ll feel the weight if you have a lot of plant material to trim. But for those who have a small amount of very thick hedge, this model is perfect. Not as durable as other models. If you’re tired of trying to find and fit extension cords, are worried about cord safety, or just don’t want to get electrocuted, then this Sun Joe 20 inch Cordless Hedge Trimmer (Amazon link) is the one for you. It’s a few dollars more than the corded model listed above, but it’s a lot safer. Feel free to change direction or angle while using this hedge trimmer. There’s no cord to get tangled or accidentally cut. You won’t smell like gas or accidentally cut your expensive extension cord when you use this Sun Joe 20” Cordless Hedge Trimmer. It uses a rechargeable 20 volt 2.0 Ah EcoSharp lithium-ion battery, which gives you 40 minutes of hedge trimming on a single charge. The body of the trimmer is very small and painted lime green, with both a rear handle and a top T-handle for built-in stability. There’s a tall, black angled hand guard to protect your knuckles from flying debris. It’s easy to maneuver and change angles. The long yellow blade is 20.4” in length and lined on both sides with dual action black rust-resistant steel blades. There’s a dual handed safety switch so it won’t accidentally start. Since the motor is smaller, this machine is very lightweight and is only 5.3 lbs. However, this hedge trimmer does have a 2 amp motor, which is the smallest and least powerful out of these five models. Less power means you won’t be able to handle thicker hedges, scrub brush, and branches. It only cuts branches up to 0.62” in diameter. Also, the fact it’s cordless makes it more expensive than the lower priced corded models with larger motors and longer blades. If you’re dealing with hedges that are older, they may have thick branches. You definitely want a hedge trimmer that has plenty of power so that this type of foliage can be trimmed. If you will be doing some heavy cutting, choose a model that has larger tooth gaps, which is more suitable for heavy cutting and hedging. When you’re using a hedge trimmer, you will be holding it at about chest level. It should have a lightweight and be relatively balanced so that you don’t become quickly fatigued. Having a lightweight, balanced trimmer will allow you to get more done. Before you make your purchase, take the effort to pick up various models and make the same motions you would if you were actually using it with the power turned on. If you’ve worked with gas-powered lawn equipment, you know that they can be loud. You may want to consider utilizing a cordless or electric model, which are usually much quieter. The blade size of your hedge trimmer must also be considered. The blade gap is the space that is in between the blades on your trimmer. Typically, you’ll want to have a gap size that is 3/8 inches to 3/4 inches wide. It’s important to find a model that has a good warranty. 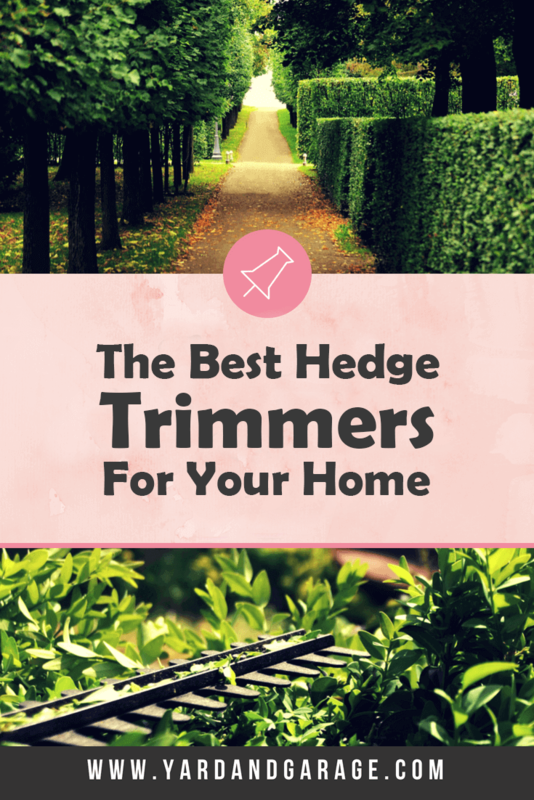 Even some of the most popular hedge trimmers can have problems. Consider buying a model that has a guarantee of lasting at least two years. On some commercial units, you may be able to find warranties that are guaranteed for five years. If you’ll be using your trimmer between fences, walls, hedges or other plants, it helps to have a rotating blade. This will allow you to comfortably hold your trimmer. In addition, it makes it safe for cutting when you need to hold the trimmer at different angles. If you will be using this piece of equipment near dogs, children or other types of similar distractions, it may be advisable to use a trimmer that requires you to keep your finger pressed down on the operating switch. However, you may want to utilize a unit that has a locking switch, especially if you plan on using your unit in a continuous manner. If you are purchasing a model that has battery power, it will usually operate at 100 percent until it finally runs out of juice. If you decide to utilize a cordless model, you don’t have to worry about walking too far out of the vicinity of your power source. Also, a cordless model will not contain a cord that can get snagged by foliage or ladders. In the world of hedge trimmers, we’re looking for three top features: motor size, blade size, and weight. The best hedge trimmer which fits all three of these criteria is the Greenworks 22 inch Corded Hedge Trimmer (Amazon link). It has the ideal combination of a powerful motor to cut thicker hedges, a longer blade for reachability, and it weighs less than 6 pounds. That’s all for an inexpensive price, too. I’d also recommend the Sun Joe 20 inch Cordless Hedge Trimmer (Amazon link). It’s got a smaller motor, but you can ditch extension cords and tackle light jobs with ease. No matter which one you choose, don’t hedge your bets and put your hedge fund towards getting one of these trimmers!